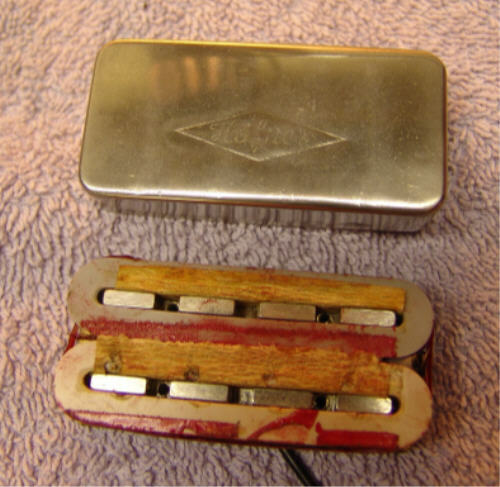 Pickup cover removed from base, with coils still fitted onto twin sets of polepieces. 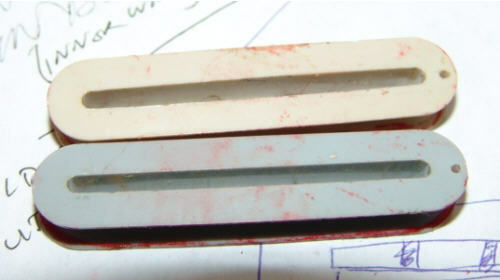 Coils removed from pole pieces. Brett - This shows both coils: one that is full original (loose winds), and one that I removed most of the winds so you can see how/where the inner lead wire is attached. Brett - Here is a picture showing empty bobbins after I removed the wire. The bobbins are different colours as you can see. I have seen this before in other 2 coil Hofner pickups. I find no reason for this, the bobbins are wound the same direction. The coil leads are wired so they have opposite paths to ground. This is how you get the "humbucking" hum cancellation. This is accomplished on Hofners by connecting the coils outer leads together. You can see the small hole in each bobbin with a wire in it - this is the inner lead. One of the coils inner leads is soldered to ground on the base plate. 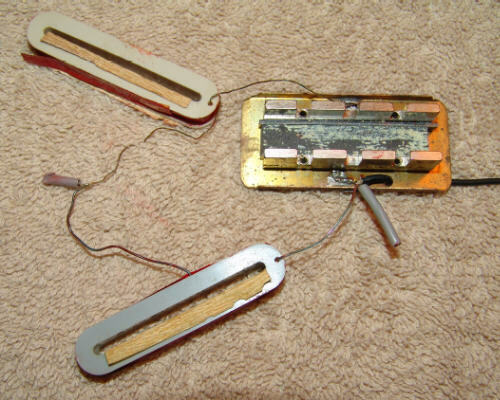 The other coils inner lead is soldered to the pickups output lead.